And now back to business… this week in the form of bias skirts. 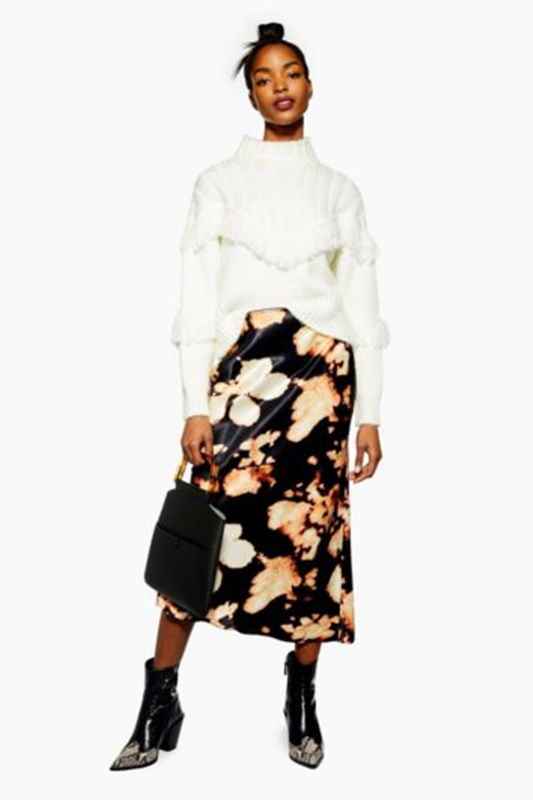 While pleats reigned supreme in the court of skirts in 2018, this year is all about the bias skirt. What is this bias malarkey you ask?! Well essentially cutting something on the bias, means cutting the fabric diagonally (instead of straight up and down). Before I lose you, it doesn’t matter what the technical term is, what matters is how they fit. And that is the beauty of a bias cut skirt because it will sit much better on curves, flowing around them rather than hanging straight. There is also more stretch in the fabric which is always a good thing. In short, it’s a pretty darned forgiving skirt style. I tried this one on and have been thinking about it ever since. Perfect now with a chunky/fluffy knit and a leather jacket or wool coat. Then swap for a tee and trainers come the summer. Another tiger option that is a new arrival but already sold out in some sizes and with low stock levels on others. This was on last week’s snakeskin blog but makes a re-appearance here! There is also this one from New Look. 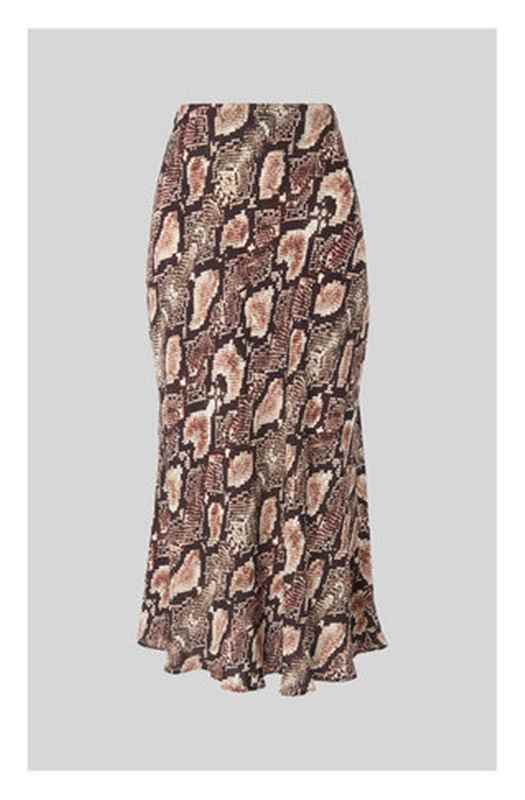 Grab a sale bargain with this snakey number at Whistles. An alternative to snake and tiger, go for a good old leopard print. This would work just as well with a bigger knit as it does with the slim fitting polo neck styled here. This style also comes in a plain black and a zebra print which is sold out online but is in stock in stores. Well this comes in several colours: black, yellow, beige, white and grey and they are mostly sold out but you will definitely find in store – particularly the larger ones as Oxford Street had loads of stock. 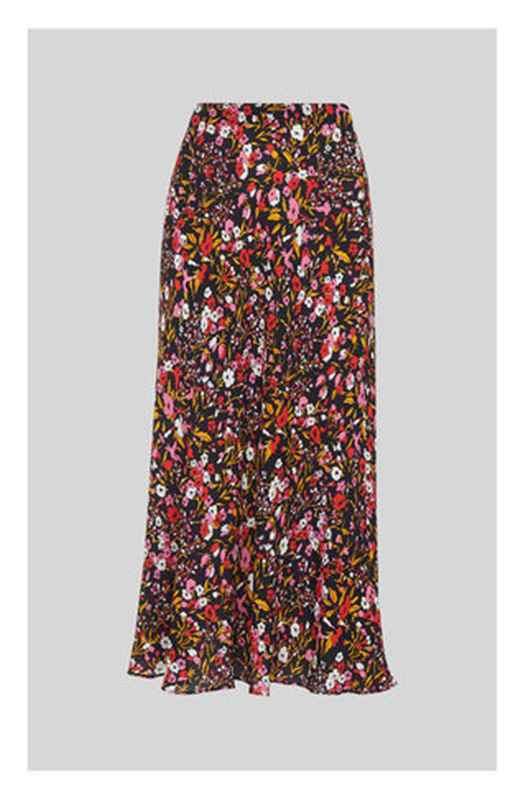 If you are out of luck then try New Look for their Satin Bias Cut Midi Skirt £19.99 which comes in lots of plains. 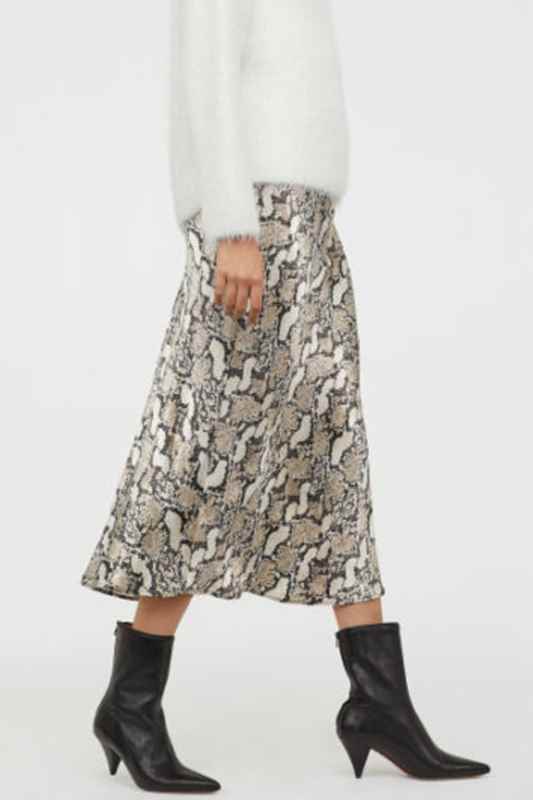 Another plain option which comes in various neutrals from black, grey and khaki to several different coloured snake prints. 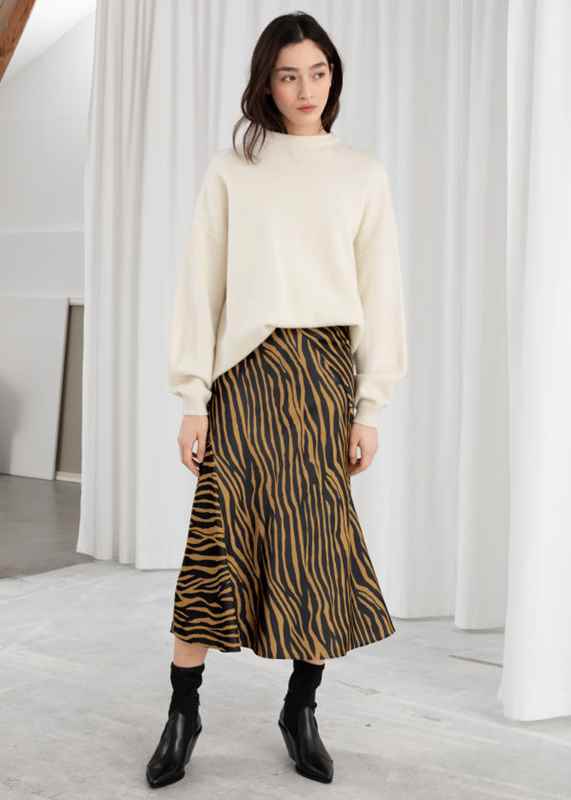 If you don’t want anything animal-y then this is a great print as you can pick out so many different colours to wear on top. 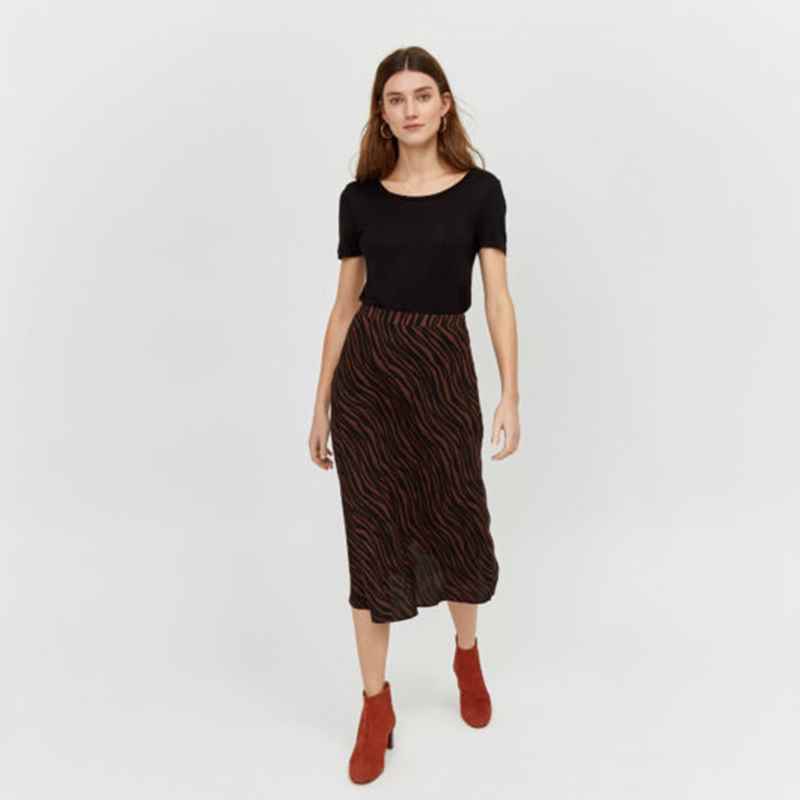 You know when Topshop says something is a trending product that you’re going to have to jump on it before it sells out… So make a statement in this printed option which you can wear in so many ways thanks to the multi-coloured print. Go light or dark on top depending on your colouring/mood/weather. It also comes in a rust jacquard – and a tiger print which is way too much for me! And the key to styling a bias skirt is getting the right proportions with your top half. 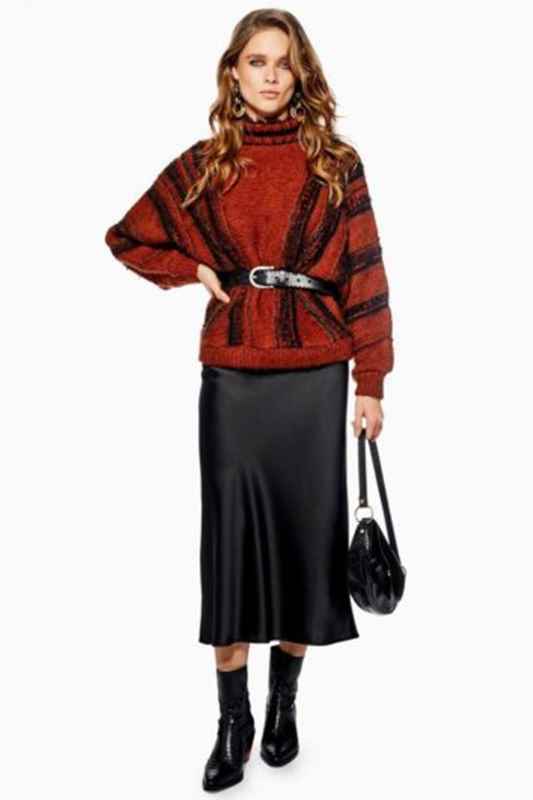 So do a messy front tuck, belt your sweater or go for a cropped style that finishes at the right point.